There are some things that make life so easy it makes you wonder why you never thought about them before. I did not think of adding this as a tip until a friend of mine opened my cutlery drawer and found scissors in it. Since many bags and packages have a little drawing of scissors on them, I assumed the best tool to use was scissors. I thought everyone had a pair in the kitchen too, but I guess not. “What do you do when you need to open a sealed bag or cut the corner of a milk carton?” I asked her. 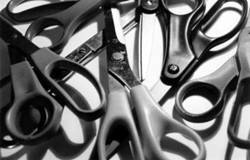 The first time I saw scissors in the kitchen as an essential tool was at Gal’s mum’s kitchen. She was a very practical woman and I admired her and decided to do the same. In our house, there are always scissors in the cutlery drawer. Everything I need to open, I cut with scissors. It is easily available and for a long time, I thought scissors were for opening things. During the past month, my kids decided to experiment with the scissors. This is wonderful with kids – they see you using something one way for a long time and still experiment and find different uses for it. At least my kids are not afraid to try different things. When I worked for 4 years in the Creative Thinking project, we showed the kids various things and asked them to find as many ways to use them as they could. Anyway, at home, I did not ask the kids to look for different things to do with scissors, it just happened and I think they liked the idea so much they became creative with the use of scissors in the kitchen. It started when Eden fried some meat for a salad. When it came out of the pan, she took the scissors and cut the meat to tiny pieces. The pieces came out equal in size and everyone was impressed. Two days later, I asked Noff to bring me some spring onion from the garden and wanted to put it in the salad. She went to the drawer, took out the scissors, picked the onions, washed them and chopped them with scissors into the salad. I think she had so much fun she put more spring onion than she would have if she had cut it with a knife (spring onion is not one of her favorite foods). One day, Noff’s friend came over and they made a cheese twisties (puff pastry filled with cheese and spices, twisted and baked to perfection). They were having lots of fun preparing the sheets of pastry and then Tsoof brought some scissors and they cut the sheets with scissors. Did you know that cutting puff pastry with scissors is very easy? It is. Any kid can do it. Using scissors in the kitchen is a great tool for young children that need to develop their fine motor skills. 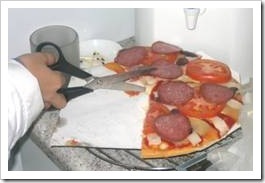 You see, instead of always cutting paper, they can cut other things and it is especially fun to cut food. 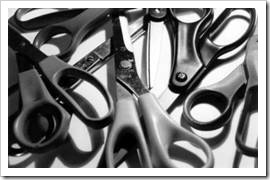 I know there are some special scissors for the kitchen, but I use simple scissors – no brand name, the same ones I use to cut paper. They work great and if when they get dirty, I put them in the dishwasher. Do you have scissors in the kitchen? I was shocked myself when my mother in law used it in her kitchen. (She was not my mother in law then). I think of the scissors in the kitchen as to many other things. After we use them we don’t know how did we survived without them. Good quality scissors can be washed in the dishwasher. I don’t cut meat as much but I should. It makes so much sense. doesn’t it? I don’t know how I got along without kitchen scissors for so long. My s-i-l was at my house about 10 years ago and asked me where I kept my scissors. She was shocked when I said I didn’t have any. She rectified the situation the next Christmas and I have been using them for everything since! My favorite use is to cut up meat while it is still partially frozen for stir frys or stew. I just make sure that they are washed really well before I use them for anything else. I think that in Asian countries people use scissors in the kitchen a lot. When we lived in Singapore I have seen people using it too. You are right, kids can use it safely and start participating in the kitchen without the risk of cutting their fingers. 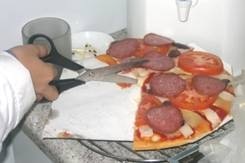 I lived in South Korea for a few years, and this reminded me that they use scissors in the kitchen all the time there.